Up until now we have used the Mandelbrot set to explore the various images that can be created with the orbit trap option. After a while though, you may feel you have exhausted the different types of images you can see by zooming into various parts of the Mandelbrot set (although you might be surprised at what you find if you zoom very deeply). 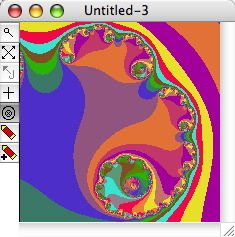 There are actually a wide variety of images that Fractal Domains can generate via the Julia tool and the Preview window, which lets you explore in real time the images that can be produced with the Julia tool. 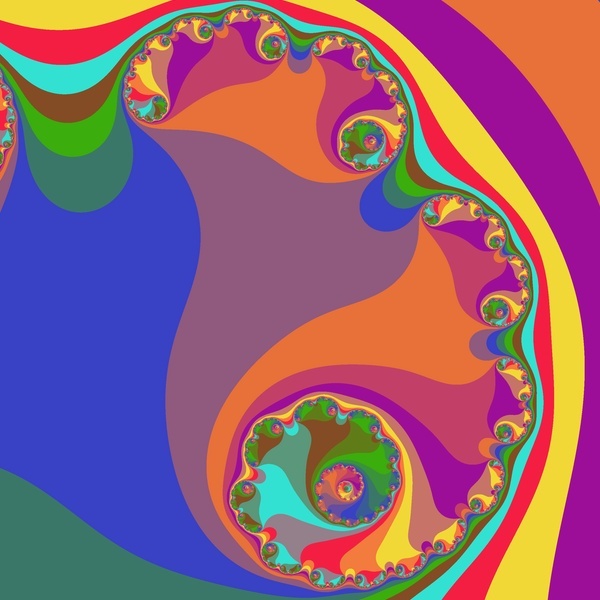 The Mandelbrot set is a kind of map of Julia sets; every point in the plane corresponds to a different Julia set, and the black parts of the Mandelbrot set are points corresponding to Julia sets which are “connected” (informally, this means the set is all in one piece). 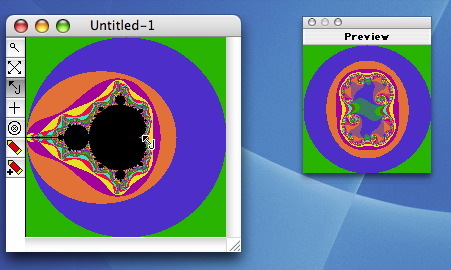 Now move the cursor over the fractal window. As you might have already noticed, you see an image in the preview window that changes as you move the cursor. 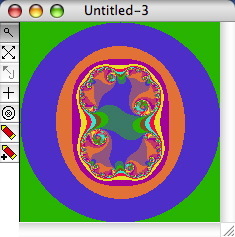 The preview window is actually showing you the image that you will get if you click the Julia tool at a particular point in the fractal window. Here is an example of what you see if you drag the cursor over the tip of the Mandelbrot set. In this illustration, the mouse is over a “bud” near the middle of the window. This is what it looks like when the mouse is over the other end of the set. 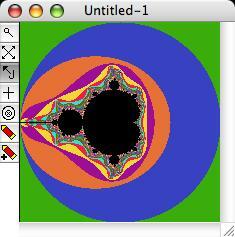 In this case it is not over an point of the Mandelbrot set (i.e. a black point) so we don’t see any black areas in the corresponding Julia set. Now that we have covered the basic concept of the Julia tool and the Preview window, let’s look at what we can do when we turn on orbit traps.